Organisms are well adapted to survive in their normal environment. Population size depends on a variety of factors including competition, predation, disease and human influences. Changes in the environment may affect the distribution and behaviour of organisms. To survive, organisms require a supply of materials from their surroundings and from the other living organisms there. Organisms live, grow and reproduce in places where, and at times when, conditions are suitable. To be able to obtain a certain food better. To make it more difficult for predators to catch them. 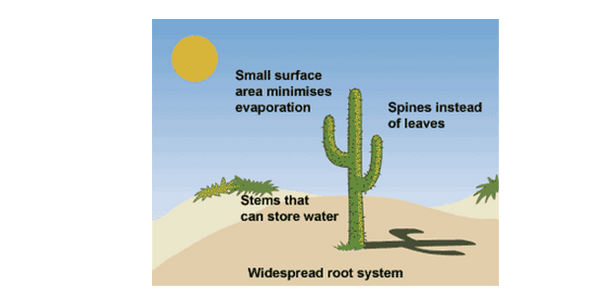 Plants lose water vapour from the surface of their leaves. It is essential that they have adaptations which minimise this. Extremophiles are organisms that live in extreme environments. Some may be tolerant to high levels of salt, high temperatures or high pressures. Animals and plants may be adapted to cope with specific features of their environment eg thorns, poisons and warning colours to deter predators. The camel can go without food and water for 3 to 4 days. Fat stored in their humps provides long term food reserve, and a supply of metabolic water. The fat is not distributed around the body; this reduces insulation, allowing more heat loss. They are tall and thin, increasing their surface area to volume ration, increasing heat loss by radiation. Polar bear has thick fur and fat beneath its skin to insulate it. Their large, furry feet help to distribute their weight as they walk on a thin ice. They are white which camouflages them against the snow. This helps them to hunt. They are compact in shape, reducing their surface area to volume ratio; this reduces heat loss by radiation. Spines guard against most browsing herbivorous animals. A thick waxy coating surrounds the plant to reduce evaporation. Roots tend to spread sideways to catch rain water. Many of the plants are small, growing close to the ground and very close together to avoid the wind and conserve heat. Some possess a light, fuzzy covering to insulate the buds so they can grow. Many are dark colors of blue and purple to absorb the heat from the sunlight even during the winter months. Because of the cold and short growing seasons, arctic plants grow very slowly. Some grow for ten years before they produce any buds for reproduction. Microorganisms have adaptations that enable them to survive in different environments. Slime capsule around some bacterial cell wall sticks them to surfaces and prevents them drying out. Some have the ability to form spores to survive when conditions are harsh. Some microorganisms have flagella which enable them to move around quickly. Bacteria undergo rapid reproduction when conditions are favourable. Changes in the environment affect the distribution of living organisms. For example, the changing distribution of some bird species and the disappearance of pollinating insects including bees. Animals and plants are subjected to environmental changes. Such changes may be caused by living or non-living factors. Competition – for: food, light, water, space. Lichens are symbiotic associations of algae and fungi species that attach to tree trunks and rock. They are sensitive to changes in air quality. They are very sensitive to sulphur dioxide (SO2) pollution in the air. This is released from industry and burning fossil fuels, especially coal. Lichens absorb sulphur dioxide dissolved in water. It destroys the chlorophyll in the algae preventing it from photosynthesising and killing the lichen. Some species only grow in non-polluted air. Some species grow in polluted air. These lichens can be used as air pollution indicators. Invertebrate animals are sensitive to changes in the concentration of dissolved oxygen in water. Oxygen concentrations decrease when pollutants are released into rivers and lakes. Some invertebrates survive in low-oxygen concentrations. Some invertebrates can only survive in higher oxygen concentrations. These invertebrate animals can be used as water pollution indicators. Environmental changes can be measured using non-living indicators. For example. oxygen levels, temperature and rainfall.